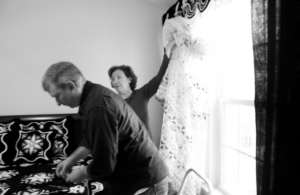 Emily and David Leblang are the the curtain installation duo. They’ve been volunteers since 2016 and have installed 35 curtains in 30 different houses around the windows, but also as a way to compartmentalize the home to lend privacy. Emily has a background in working curtains in JC Penny, David brings the power tools and her two kids bring the entertainment for the little ones running around. As Emily says: “It’s amazing how curtains turn an apartment into a home and how if changes the energy of a house. And that we all want the same things regardless of background and economic positioning: a nice home, a table, an education, providing for the family and having friends and neighbors. ” Thank you Leblang family from all of us at IN.